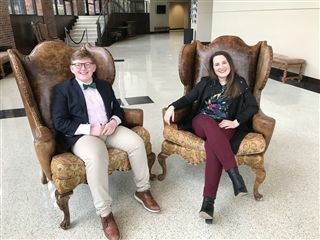 On Wednesday of this week, junior Jack Maricle had the privilege of interviewing former Cascian, Julliard graduate, and now renown Soprano Christine Taylor Price. Christine is performing in the Tulsa Opera production of "The Little Prince" this weekend. She is cast in the major role of the Rose. Showtimes are Friday, 7:30 pm and Sunday, 2:30 pm at the Tulsa PAC. Christine was back on campus Thursday to visit Mrs. Coonfield's Performance Ensemble class. She sang for them and discussed her vocal training and career. Then she worked with some of the students on vocal technique. Christine was invited to return in May when she will be back in town for the Tulsa Opera production of Don Giovanni in which she is cast as Zerlina.